An Interview with James Bamford. · One Book. One Author. One Hour. 1:31 – Were you already slated to appear on Booknotes or was this a last minute addition? – As far as he can recall, his appearance on the program less then a week after the attacks of September 11, 2001 was a last minute addition following. 2:04 – Did this change how you prepared for your appearance? – This somewhat changed how he prepared for the interview. Bamford and Richelson have known each other for many years because of their work on the technical side of the intelligence community. Bamford thinks appearing together was a great way to compliment the work of each. 2:56 – What do you remember most from the program? – He remembers it being a very timely interview. His book came out in May of 2001 after three years of research and writing. Then on the program they discussed how it was the U.S. had missed 9/11 despite spending billions on intelligence. 4:13 – What was your experience with the call-in portion of the show, and do any of the questions stand out to you? – He enjoys call-in segments because you get a lot of intelligent questions that you don’t expect. They are usually the types of questions that could be missed by hosts, even intelligent hosts. 5:05 – What do you think are the benefits or drawbacks of this longer format interview for the author or the viewer? – He does not think there are any drawbacks. He himself produces hour-long documentaries for PBS, before which time he produced two and three minute segments for ABC News. Having experience with both extremes in length for media outlets he highly recommends longer format interviews. 6:17 – Is this preparation normal for an interviewer? – Bamford has done quite a few interviews over the years and has experience with lots of different interview styles. He sees pre-interview preparation as important for interviews. 7:08 – Were you surprised you were asked biographical questions? – Biographical questions are not standard across interviews. These background questions about an author are very important to understanding the content of the book, but these kinds of questions are not possible in shorter interviews. 7:54 – Were you surprised by any of Brian Lamb’s questions? – He was happily surprised that he was able to give background about how he came to be interested in this topic. He was glad Lamb asked these kinds of questions, and wished more hosts would follow suit. 9:07 - Did your experience on the show change your impression of it? – It gave him a better understanding of how the show works. It was a unique experience to see how complex the preparation for this kind of program was. 9:44 – Would you have preferred to have a more traditional Booknotes interview? – No, he liked the program as it was because of how well his and Richelson’s books worked together. Understanding how both the NSA and CIA work separately and together was also very important at that time immediately following 9/11. 11:09 – What do you think the benefits and uses of such a collection might be? – Bamford himself is very interested in going through the collection since Lamb picked such interesting works to discuss on the program. 12:20 – If asked back would you have returned for another interview? – Bamford was surprised to hear about Lamb’ rule that guests could only appear once. He absolutely would have come back. But he does understand the rule because it provides a diversity of opinions and expertise. 13:18 – Was there a difference in sales or national attention after appearing on Booknotes? – When he wrote and published his book, national security were not high priorities on people’s minds. When the book was released in May of 2001 it sold well but quickly fell from national attention. After 9/11 people were much more interested in national security and intelligence and his appearance on the program brought his work to people’s attention. 14:33 – Did your experience on the show cause you to reconsider any of your approaches or assumptions about your research or writing? – Bamford spent a great deal of his career working in television. The care Lamb gave to his subjects pushed Bamford to work on longer documentaries and shaped his own interview style. 15:28 – What have you been working on since this book and which pieces are you most pleased with? – He has written two more books, done documentaries for PBS, and is a columnist for Foreign Policy magazine. 16:36 – What had been the lasting impact of Booknotes? – When he was in college and law school he always wanted to be an author. Bamford believes that this program inspired others to write. 18:15 – Is there anything else you would like to add? – Booknotes, C-SPAN, and Brian Lamb are all very important for the cultural history of the United States because each filled a need to educate the American public. 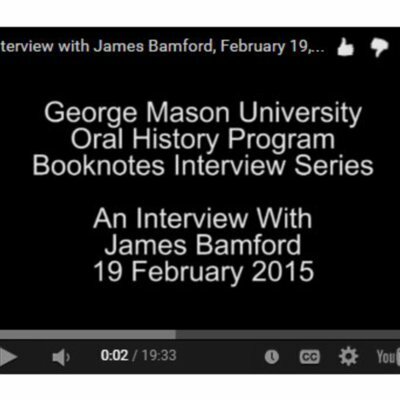 Lindsey Bestebreurtje (Oral Historian), “An Interview with James Bamford.,” One Book. One Author. One Hour., accessed April 24, 2019, http://booknotes.gmu.edu/items/show/2787. Booknotes Oral History Series. R0143 Box 02 File 13.